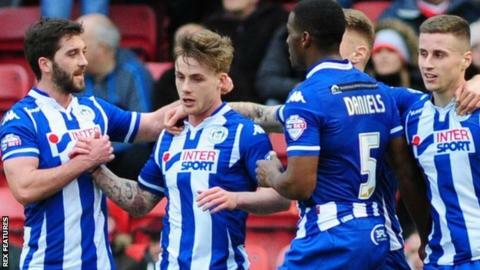 Wigan Athletic climbed into the League One automatic promotion places as substitute Yanic Wildschut's injury-time goal gave them victory at Walsall. In a first half with more bookings than shots on target, Conor McAleny struck from 25 yards to put the Latics ahead. Wigan threatened a second before Sam Mantom thumped in the equaliser after a Jason Demetriou free-kick was blocked. There were chances at both ends before Wildschut cut inside to win it, beating keeper Neil Etheridge at his near post. Wigan rise to second in the table after extending their unbeaten run to 11 games, while the Saddlers slip a place to fourth after a second successive home defeat. Sean O'Driscoll's side, who have won just once in six matches, in all competitions, are still without a home win in 2016. "We struggled first half to get any rhythm. Early on, you realised that Wigan's game plan was to stop the full-backs. You've got to give them some credit. "Our game plan all week was to do certain things and that went out the window early on. We got a little frustrated with each other, and it was a bit like a chess match first half. "We sort of cancelled each other out. But a worldie goal got them in front which you can't really legislate for." "If we'd put the game to bed in the first half, it would have been a lot easier for everyone. "We never know when we're down or when we're beat - we keep coming back. At 1-1, we made attacking subs. We had an intent to go and win. "I thought in terms of the whole 90 minutes, we were the better team and deserved to win." Match ends, Walsall 1, Wigan Athletic 2. Second Half ends, Walsall 1, Wigan Athletic 2. Corner, Wigan Athletic. Conceded by Adam Chambers. Corner, Walsall. Conceded by Craig Morgan. Jason Demetriou (Walsall) is shown the yellow card for a bad foul. David Perkins (Wigan Athletic) wins a free kick in the attacking half. Substitution, Walsall. Jordan Cook replaces Matt Preston. Goal! Walsall 1, Wigan Athletic 2. Yanic Wildschut (Wigan Athletic) right footed shot from outside the box to the bottom right corner. Attempt saved. William Grigg (Wigan Athletic) right footed shot from the left side of the six yard box is saved in the bottom left corner. Chris McCann (Wigan Athletic) wins a free kick in the attacking half. Substitution, Wigan Athletic. Reece Wabara replaces Donervon Daniels because of an injury. Corner, Walsall. Conceded by Jussi Jääskeläinen. Attempt saved. Milan Lalkovic (Walsall) right footed shot from the centre of the box is saved in the top centre of the goal. Corner, Walsall. Conceded by William Grigg. Corner, Walsall. Conceded by Jason Pearce. Hand ball by Max Power (Wigan Athletic). Attempt missed. William Grigg (Wigan Athletic) right footed shot from the centre of the box is close, but misses to the left. Attempt missed. Anthony Forde (Walsall) right footed shot from outside the box is close, but misses to the right. Foul by Jason Pearce (Wigan Athletic). Substitution, Wigan Athletic. Yanic Wildschut replaces Ryan Colclough. Ryan Colclough (Wigan Athletic) wins a free kick in the attacking half. Corner, Walsall. Conceded by Max Power. Goal! Walsall 1, Wigan Athletic 1. Sam Mantom (Walsall) right footed shot from outside the box to the top left corner. Milan Lalkovic (Walsall) wins a free kick in the attacking half. Attempt missed. Conor McAleny (Wigan Athletic) right footed shot from outside the box is close, but misses to the left. Matt Preston (Walsall) is shown the yellow card for a bad foul.